Many people dream of turning a hobby into a profession. For Manhattan resident Joseph Wyatt, that dream became reality. Wyatt, 27, is the owner of Goblin Games, a store that sells supplies for card games, board games and other tabletop entertainment. Wyatt said he primarily wanted to provide a location for people to play “Magic: The Gathering” and other trading card games. Wyatt said he originally had no intention of owning a business. Alexander Staggs, senior in animal science, said he visits Goblin Games a couple times a month and considers himself a member of the Magic community. 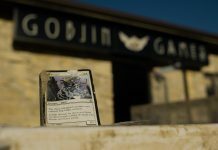 “(Goblin Games) is the most convenient location for me to go and play Magic: The Gathering,” Staggs said. Staggs said the staff at Goblin Games offer better customer service and knowledge of the game than the other game stores he has visited. 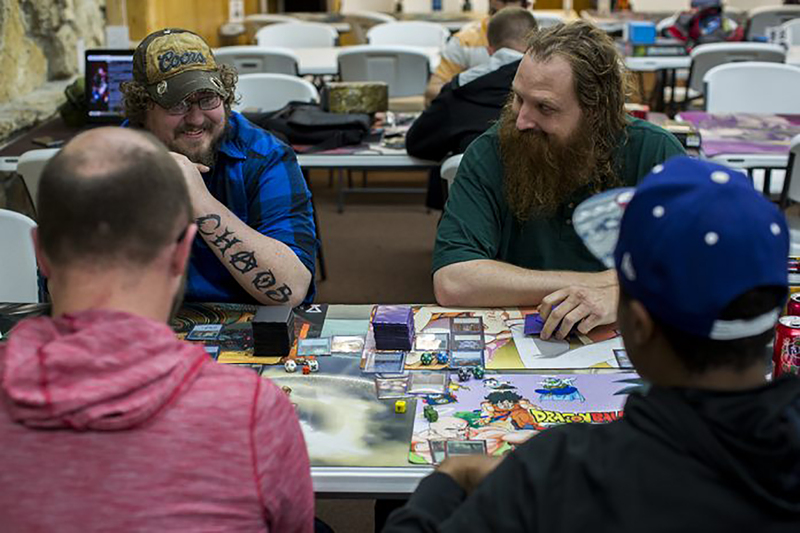 Wyatt said many stores that sell “Magic: The Gathering” cards or host tournaments usually are not staffed by well-informed players of the game. He said he believes this disconnect makes players feel like second-class customers. “Magic: The Gathering” is a popular card game with over 16,000 unique cards. A standard game consists of two players each casting spells from their decks in an effort to reduce their opponent’s life points to zero. The game has different formats, including some created by the players to help keep the game fresh. Depending on what format a person wants to play, decks of cards can cost anywhere from $20 to $500. When Wyatt and his fiancée, Anne Higley, made the decision to open a game store, Higley knew a little about “Magic: The Gathering” and worked a full-time job to help finance Goblin Games. Wyatt said they started building the business in the summer of 2014 when they went to the seizure auction of a game store in Junction City. At this auction, they purchased a little over $3,000 of “Magic: The Gathering” supplies as an initial investment for their future storefront. Wyatt contacted distributers and supplied them with a picture of the storefront and Goblin Games’ tax identification as he certified his new business. Wyatt said Goblin Games was originally scheduled to open in October 2014, but was pushed back until its doors opened on Jan. 23, 2015 after the building underwent renovations to gain the approval of the fire marshal. Daithin Wycoff, 23 and an employee of Goblin Games, said earning a living from selling cards is a matter of supply and demand. Wycoff said the store makes a profit by tracking the prices of individual cards and making sure it has the card in stock if the card suddenly becomes popular. 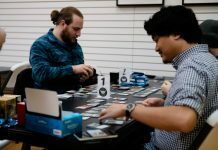 Wycoff said tracking cards involves a combination of watching professional “Magic: The Gathering” tournaments as well as studying what decks local players are using. “It’s pretty easy, you just have to be more knowledgeable about your product than most other sales jobs,” Wycoff said. Wycoff said he has played “Magic: The Gathering” for seven years but took it upon himself to research what other games are sold in the store and what features classify them. “If someone comes in like, ‘What is a good board game? Hey, is this good?’ I can give them something rather than saying, ‘I don’t know,'” Wycoff said. In regards to the store’s future, Wyatt said his first goal is to have the store remain open longer than five years. “Five years is kind of the mark where all the game stores die,” Wyatt said.